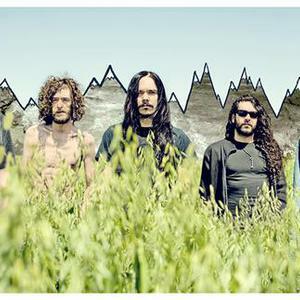 Fair to Midland are a progressive rock band formed in Sulphur Springs, Texas in 1998. Anyone who thinks the phrase ?it's all been done before? carries real weight clearly has yet to encounter Fair to Midland. Dark, heavy, moving, cryptic, progressive art rock collides with flourishes of old-school country, Americana and Delta Blues in their sound. These Lonestar boys genre-defying and boundary obliterating ocean of sound righteously upends the old phrase ?fair to middling? from which their Texas-ified moniker was drawn. Anyone who thinks the phrase ?it's all been done before? carries real weight clearly has yet to encounter Fair to Midland. Dark, heavy, moving, cryptic, progressive art rock collides with flourishes of old-school country, Americana and Delta Blues in their sound. These Lonestar boys genre-defying and boundary obliterating ocean of sound righteously upends the old phrase ?fair to middling? from which their Texas-ified moniker was drawn. Arrows & Anchors, the five-piece band's first album in partnership with eOne Music, is meaner, sadder and altogether more desperate of an affair than its predecessors. ?It's a very bitter album,? offers vocalist Darroh Sudderth. ?The last album had some light at the end of the tunnel in some of the subject matter. This one doesn't have that quite so much.? This particularly invigorating yet undeniably gut-wrenching collection of songs is the product of a string of years of career strife since the group last poked their head into magazines and record shops. Arrows and Anchors follows a change in record label, a change in management and one (?maybe two,? Sudderth laughs) changes in booking agent. All of that change and upheaval definitely played a role in the creative process; artistic lemonade from business lemons. There has never been a lack of faith from the diehard admirers who have steadily adopted the band as their own in growing numbers since Fair to Midland's initial pair of self-released albums, The Carbon Copy Silver Lining (2001) and inter.funda.stifle (2004). Both were explorations into the furthest reaches of the musical psyche that earned them praise from critics, fans and fellow musicians. Fair to Midland are a true ?band's band.? So much so, in fact, that eclectic musical connoisseur and multiplatinum recording artist Serj Tankian, best known as the frontman for System of a Down, signed them to his Serjikal Strike imprint, which released The Drawn & Quartered EP (2006) and the band's third full-length album, Fables From a Mayfly: What I Tell You Three Times is True (2007). A killer live show and intensive roadwork as a headliner, at prestigious festivals such as Coachella, Download, Rock AM Ring and Rock IM Ring and together with bands like Alice in Chains, Smashing Pumpkins, Flyleaf and DIR EN GREY has brought the band's skillful and adept approach to art rock infused prog-metal to international attention. There are a few of their by now trademarked tongue-in-cheek dalliances to be sure but for the most part Arrows and Anchors is Fair to Midland's most cynical offering. By the same turn, it's a performance album with a laser-like focus on the raw passion and intensity. In an age of overly processed heavy music, the band partnered with producer Joe Barresi (Queens of the Stone Age, Coheed and Cambria, Melvins) who sequestered them into his self-appointed House of Compression in Pasadena, California and wrenched out top-tier performances. The recording captures an authenticity and a sincerity that's lacking in most modern records. ?We always want to work with someone who is interested and enthusiastic to work with us,? Sudderth explains. ?Because at the end of the day they're going to spend that much more time wanting to make the record their own, as well. We didn't want to worry about everything being immaculate, pristine and polished. This is absolutely a performance-driven record.? Arrows & Anchors is also a testament to Fair to Midland's personal chemistry and unique collaborative perspective. Some songs were written together. Others were demoed out by a particular member ? say keyboardist Matt Langley or his six string cohort, Cliff Campbell ? right down to the programmed drums. ?Or maybe I brought a completed song where I programmed whatever instruments I can't play,? Sudderth elaborates. It was a very open process. The bizarrely creative and inspired vocals and guitar work in Fair to Midland play against the counterintuitive and monstrously rhythmic backbeat of drummer Brett Stowers and bassist Jon Dicken. Matt Langley's ethereal electronics enhance everything else. The group's canvas is as expansive and breathtaking as the state of Texas itself. Fair to Midland is one of the rare bands who expertly walk the fine line between accessibility and integrity, between open lines of communication and introverted psychic exploration. ?We're not gifted songwriters,? Sudderth says with genuine self-effacing humility. ?So we have to be really resourceful and that's a talent in and of itself. We do our best.? Fair to Midland's current lineup consists of Darroh Sudderth (vocals, banjo, mandolin, bass), Cliff Campbell (guitar), Matt Langley (keys), Ryan Collier (bass), and Logan Kennedy (drums). In November 2011, the band released their first DVD, Welcome to the Dirt, consisting mainly of band shots and fan footage of live shows. The DVD is distributed exclusively through their own merchandise site. The profit from this release helped fund a professional video recording of the band's show at The Machine Shop in Flint, Michigan on December 17. This footage will be released worldwide on DVD on March 27, 2012. Arrows & Anchors will also be released on double vinyl on March 26, limited to 250 copies.